The development of gtknode, the Erlang binding for the GTK+ library, is now hosted as a Google Code project. gtknode was previously included in the Jungerl collection of Erlang code on Sourceforge. The version on Google Code (version 0.15) is the latest version from Mats Cronqvist, the author of gtknode. This version includes my improvements of the build system using GNU Autoconf (and my GNU Autoconf macros) and GNU Automake. Mats Cronqvist also added a new example application, sherk, which is a preliminary version of a graphical front-end to Mats’ (unpublished?) sherk profiler. These steps create a gtknode-0.15.tar.gz in the current directory. After uncompressing this file, you get the same content as after step 3 above. I have a GTK+-related bug when starting the top example, which replaces the old simpleexample. I have to investigate into this. 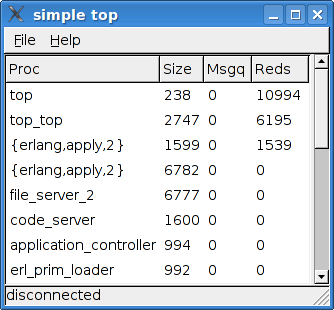 I was not able to test the sherk profiler front-end example, since I have not yet found where I can download Mats’ sherk profiler from.